Do you dream of working and living wherever you want, but are concerned about being lonely? Michelle Sims shares a very cool new concept in co-working and co-living called Roam.co, as well as her own experience working as a digital nomad. 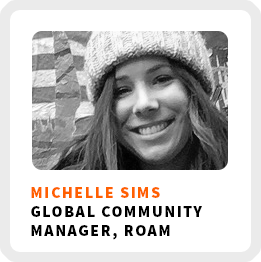 As the global community manager of Roam, she helps digital nomads find community wherever they choose to work in the world. They have locations all over the world including Tokyo, Bali, San Franciso, Miami and London. Why Roam isn’t just for digital nomads. How they use their community model to support local charities. The changing definition of what it means to be a digital nomad. The opportunity to stick your roots into the local lifestyles. Ideal work environment: In the co-working space with her earphones on, around 4:00 pm. Regains focus by: Going for a walk. 1) Don’t think too much about it since there is always so much unknowingness. 2) Just book the ticket and enjoy every moment. Use code skillsthatmatter for $100 off when you book with Roam.